I was born in the long-standing city Staritsa, in the Tver region, in August 1963. Due to some tragic events that occurred in my family we moved to Tver, which was formerly known as Kalinin. In Tver I went to secondary school and in the 4th grade I started boxing at the Dynamo sports club. The first competition was two weeks after I joined this club. It was a Dynamo Youth Championship, where I took the second place. It was my first medal, which I was very proud. Life without a father and a difficult financial situation motivated me to boxing classes. Boxing club became my second family, where boys like me from problem and broken families trained. It was a glorious time. From little boys we were turning into young men, with our own laws, notions, and intolerance for injustice. We dished out our justice and restored fairness with our fists since at the time we had no other arguments. I turned eighteen and came of age. A year earlier I entered university– The Kalinin Institute of Technology. The admission there was made easier by the fact that they saw me not as a future engineer but a person who will fight in the sports championships for the college. 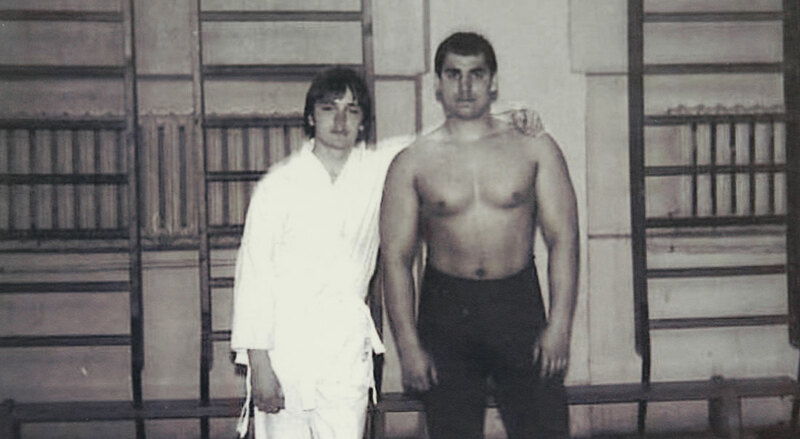 In 1982, I retired from professional sport and started training for myself in the usual schedule: morning 10 km jogging, breakfast, classes at the institute, and in the evening four hour workout in the gym: two hours with weights and two hours of boxing. I didn’t suspect then that my whole life will change in that year. We trained together with friends in our boxing gym, as usual, and that day a strange group of men came into our gym. They changed into the training clothes and started to do some kind of slow movements. Their mentor did not impress me then, and it looked to me that he is deluding them and leading them away from reality. That person was Mikhail Ryabko, who just came out of his conscript service in the army. We stayed there with the “colleagues” and finished watching this so-called training ‘till the end. After the training session Mikhail asked us our opinion, asked whether we liked the training and what do we think about it. He heard a categorical “no” as an answer, and a few more remarks that were even less polite. That smiling person was surprisingly calm, and invited us to come to another gym where he was teaching. Why do I write about it? Because this is what was important to me in that whole story - that I was asked my opinion - nothing else impressed me. That was an astute psychological move on Mikhail’s part. I started attending his classes. For a complete year I was coming there and watching what his students were doing. Without participating myself, however. It was actually giving me more enthusiasm in my boxing training. And finally the moment of truth came. I was adamant in my decision that Mikhail is cheating and deluding people with his trainings. The only conclusion was – he had to be beaten up in front of his cheated students (and therefore shown to be the fraud that he was). So I offered to fight him. He calmly accepted the offer… Anyway, in all my history of competitions, I have never been in such a deep knockout. Never in my life have I received such a strong punch into my body. When I recovered, I asked to train with Mikhail. I wanted very much to learn to move and hit as he did. That’s how I encountered Systema. It was a tough time, I was leaving and then returning again. But that is another story, and maybe I’ll tell it someday. It was hard to get rid of stereotypes, acquired earlier. The System was based on completely different principles and this was the main problem for comprehension and acceptance. Systema definitely changed my outlook on life and my attitude towards life and people. All of us make mistakes in our lives, and it is hard to admit them. And it is even harder to change our character. I heard somewhere an expression that said a person’s nature cannot be changed. Maybe, but I tried and will continue to try with all my strength. And I think I am succeeding – I stopped cursing, stopped quarreling with people, and started to accept people’s behaviors with understanding. I started changing and the world around me started to change. Life became enjoyable and fullfilling. I have an wonderful family, a wife that I love and two beautiful children, a boy and a girl. If you’d ask whether I would have wanted to change anything in my life, I’d say no. It is my experience that allowed me to understand a lot about life and to live as I now do, fully and happy. I would like to deeply thank my mother who preserved my life and let me live and go free, as a result of which I acquired my home, family, and wonderful friends.